Printers blow through ink as extravagantly as Wall Street bankers blow through bailout money. And your printer might cry "no ink!" when in fact it has plenty to spare. (See our story, "How Much Ink Is Left in That Dead Cartridge?") Whatever the case, no one likes paying for pricey ink and printing supplies, so let's look at ways to cut your consumption. Buy discount printer ink: Do you really need to buy pricey name-brand ink for your inkjet printer? As we found in "Cheap Ink: Will It Cost You?" inexpensive third-party and remanufactured cartridges often yield more prints than their new, branded counterparts--but they don't always deliver the same quality and fade-resistance. Thus, while you'll definitely save some money, you may not be as happy with your printer's photo output. However, if you print primarily text, there's every reason to choose the cheap stuff. This is true for laser printers as well: For years I've used only remanufactured toner cartridges in my HP and Brother lasers, and the results have always been excellent. Estimated savings: $30 on a black-ink replacement cartridge compatible with an HP 45 inkjet printer. Enable your printer's economy-mode setting (the name for this varies), and you'll squeeze more life from your ink or toner cartridge. Use your printer's economy mode: Not every page you print needs to be fit for framing, right? If you're just cranking out a draft of, say, a school paper or business presentation, why not use your printer's economy mode? True to its name, this setting uses less ink, resulting in lighter (but still readable) output. Before you print, open the printer's preferences settings from within the program's Print dialog box. Look for a setting called Draft Mode, Economy Mode, Toner Saver, or the like. (On some inkjets, the "Fast" quality setting is equivalent to economy mode.) If you can live with the results, consider making it the default setting, switching to standard (or high-quality) mode only for documents that need to look their best. Estimated savings: $25 per year. To spend less on ink and paper, try printing two pages on each sheet, as selected here in the lower-right corner. Print two sheets on each page: Here's another way to cut your printing bill: Shrink your output. 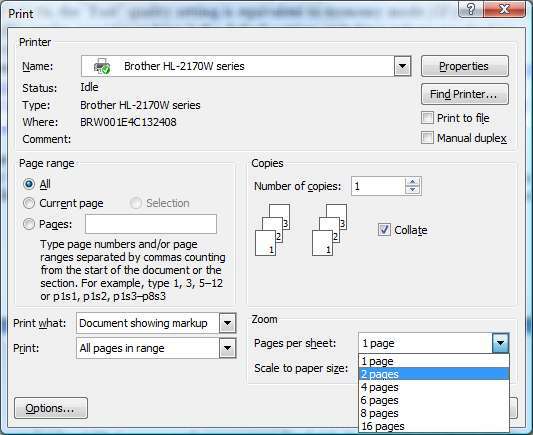 Most printer drivers can fit two pages' worth of a document on a single sheet of paper. Each page gets reduced in size and rotated 90 degrees, so that two pages land side-by-side on one sheet (think: booklet). Programs like Word and Adobe Reader give you this option right in the Print menu. In programs that don't (like Firefox), you can venture into the Properties menu for the selected printer and look for a "page layout" or "page scaling" option. Obviously this won't be practical for all your printing needs, but it will save you both ink and paper. Estimated savings: $20 per year. Print to PDF instead: The best way to save paper and ink is to bypass them entirely. Whenever possible, "print" your documents to PDF files you can store on your PC or e-mail to others. I'm partial to CutePDF Writer, a freeware "printer driver" that lets you turn virtually any document into a PDF. Obviously you need a hard copy sometimes; but before you click Print, ask yourself if you--or the document's eventual recipient--can get by with electronic text. Estimated savings: $20 per year. Get a laser printer: If you're an infrequent photo printer but like to make hard copies of Web receipts and other (mostly) text documents, you could save a lot of money by opting for an inexpensive laser printer to do routine jobs and using online photo printing services when you do want images you can touch (or hang on a wall). While laser printers still cost more than inkjets, toner's cheaper per-page cost can pay for the difference over time. But you can do your own total-cost-of-ownership math with a spreadsheet such as the one at Nifty-Stuff.com. Estimated savings: Depends on printing habits. Want more tips? Check out "Six Savvy Ways to Get More Prints for Less Money."